As an instructor of Fit 4 TwoⓇ Mom & Baby Barre and Prenatal Barre (a ballet barre, pilates, and yoga fusion class), I want to inspire you to try barre for the physical and mental benefits. From posture and flexibility to grace and poise there is no limit to the expected benefits of a barre routine that is specific for your pre and postnatal wellness. What you may not expect is one benefit that blew my mind. This one benefit that out trumps them all. After having a baby I have been quoted to say that you feel like you’ve been hit by a truck. You may feel that your body has let you down or that you just don’t feel the same. It can be hard to adjust to the fact that you just had a baby and your body won’t be the same. We can move forward by not looking back, which is easier said than done. 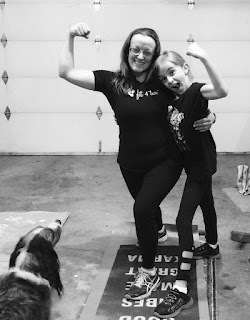 This mom (little, stocky, ex-military brat) found her self-defeating brain negatively impacting her workouts, but when I started teaching Mom & Baby Barre and Prenatal Barre I didn’t see this one thing coming. Needless to say, when you start training in Barre and then teaching it, you are forced to confront your own post-baby body image. The more I trained, the more I realized how much I was changing, mind and body. Letting it be and accepting that I am a better version of myself. Mom & Baby Barre and Prenatal Barre opened my mind to a stronger, leaner, and more graceful version of who I am today. Mom & Baby Barre and Prenatal Barre is for all moms. You are beautiful and graceful and you will see yourself transform using the flexibility and strength you are developing with the Barre technique. Your posture will improve, which we all need especially after carrying a baby for 9 months. You will rehabilitate your core by becoming more aware of your core and engaging through movement. Most of all, you will have a more positive body image. Contact your local Fit 4 TwoⓇ Franchisee for a Free Try It class pass and see if Mom & Baby Barre or Prenatal Barre is the right workout for you. Small Business Saturday. Meet Marina Lundquist. Prior to becoming a Fit 4 Two® franchisee in 2013, Marina taught classes for Fit 4 Two® Langley. When the opportunity to be her own boss became available, she couldn't wait to get started. A typical day for Marina begins 6:30am when she enjoys some quiet office time, checks her email and manages her social networking posts. Then the family is up and she is in ‘mom mode’. Getting lunch ready, daughter to school, housework, and walking the dog. Usually, she teaches classes all day and some in the evening, so she may not get back to her office for a couple of days. That's when her mobile office comes in handy. She enjoys taking a break between classes at the various local facilities. She can have a coffee and chat with the locals and check her inbox and respond to more emails and social networking. She gets home just before it's time to pick up her daughter from school and switch back to ‘mom mode’. Being a small business owner isn’t always easy. “Sometimes when I feel overwhelmed or stressed about all the details and work that goes into owning a small business, my husband says "talk to the boss". I realize, I'm the boss and I have a good laugh. Owning a small business is a lot of work but when reminded that I'm the one that makes the schedule. and I'm the one that put the work together that makes the magic happen, I realize the stress can be managed. Then I get out my yoga mat and a glass of wine and chill out.” says Marina. Small Business Saturday. Meet Erin Gabriel. Did you know that each Fit 4 Two® location is locally owned and operated? Erin Gabriel joined our team summer 2017 as the new Fit 4 Two® Surrey franchisee. Her and her husband Aiden are the proud parents of toddler Austin. “I love seeing moms come to class with their little babies looking around at new faces, and progress through making new friends, babies growing, and getting stronger and confident!” says Erin. 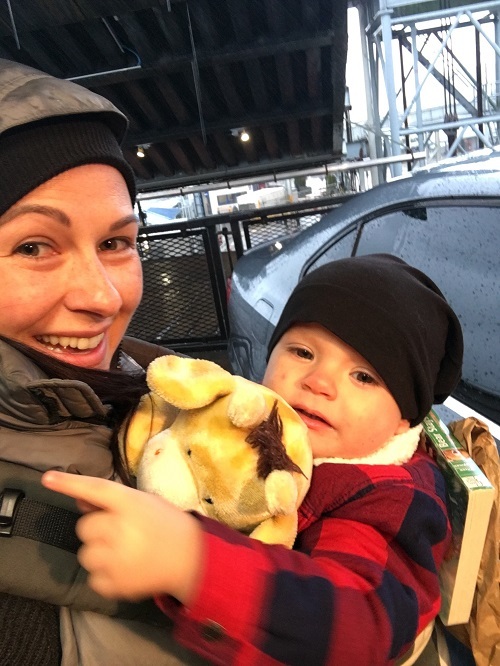 A typical day for Erin includes serving customers; training team members; working with our facilities; marketing; accounting; planning; brainstorming; organizing and of course parenting her young son.